I brought this G4 Cube housing during a local Mac user group expo for about USD 60. Sure enough, the hard drive, the G4 chip and the logic board have been removed. Just left a barebone housing. I will shead no tears for this... it was a empty case, modded into a Linux server. It's not like he gutted a working box. Even better, he is using non-MS software... which is good because I would not want to see Windows inside that case. Interesting read... they point out that Jonathan Ive is a reader of MiniITX.com. Anyway, good choice in OS and good choice in keyboard..
2. The G4, Logic Board, and Hard Drive had been removed before he bought it. It's still not quite as cool as my Cube, but it's better than that other dude that gutted a G5 to put an AMD chip in it. Ouch. Don't feel bad, I bought it too. While Red Hat is not my distro of choice (not by far!) I would still use it over OS 8.1. Now OS 8.6 is another story... well for a home desktop atleast, Red Hat still wins for me when it comes to a home server OS. I would rather work with Red Hat then any "Clasic" OS. Well no. At least it wasn't as bad as the G5 -> PC hoax. That did drive me to tears. 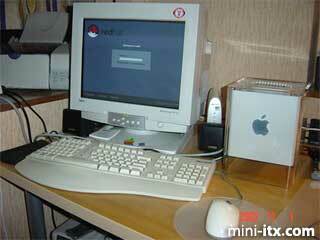 I would love the guts of a G4 Cube, sans case sitting on my desk. That would kick @$$. The ITX board is pretty weak. It is small, but it is also very weak. A G4 450 is probably significantly faster than a 1GHZ ITZ chip. (called the "C3" I believe) Too bad the cube didn't come with the internals. We actually have an ITX board lying around at the office. I've been to that site a few times. In the end, a PC104 board is better for most things. True... however the Mini-ITX boards from Via are not targeted for the same market as embeded PCs. I think the cube is probably one of the most excellent designs ever. I don't really care if it runs OS X or not though. If I could get one cheap enough I would jump at the chance. I still haven't seen many people post pics of a Mac in a Beige PC housing tho.